Parker Drilling Rig No. 114 stands on display to welcome Route 66 travelers to Elk City, Oklahoma. It is 180 feet high – one of the tallest in the world. The Anadarko Basin extends across more than 50,000 square miles of West-Central Oklahoma and the Texas Panhandle. It includes some of the most prolific – and deepest – natural gas reserves in the United States. Although most experts disagreed, Robert Hefner III believed immense natural gas reserves resided even deeper, three miles or more. A 1974 souvenir of the Bertha Rogers No. 1 well, which sought natural gas almost six miles deep in Oklahoma’s Anadarko Basin. Using specially designed extra-wide pipe, GHK and partner Lone Star Producing Company began drilling in November 1972, averaging about 60 feet per day. A string of 14-inch diameter casing weighing in excess of 106 pounds per foot was cemented in the well at 14,198 feet. The 1.3 million pounds of casing was the heaviest ever handled by any drilling rig in the history of the industry. On April 13, 1974, Bertha Rogers No. 1 reached a total depth of 31,441 feet – where it encountered liquid sulfur. According to Lone Star Producing Company, the bottom hole pressure and temperature were an estimated 24,850 pounds per square inch and 475 degrees Fahrenheit respectively. It required about eight hours for bottom hole cuttings to reach the surface almost six miles above. Drilling strained the giant rig’s equipment to the limit (the well had to be “fished” 16 months after drilling began, see Fishing in Petroleum Wells). Because of dangerous downhole conditions, including corrosive pockets of hydrogen sulfide, Dorman adds that the historic Oklahoma well had to be completed at a shallower depth. However, Dorman concludes, Hefner’s belief in the deep Anadarko Basin would prove true as drilling technologies improved by the 1990s. Decreases in drilling times by as much as two-thirds helped contain costs. By 2002, Oklahoma’s deep wells had produced more than six trillion cubic feet of natural gas – with trillions more yet to be found. In 2004, gas passed oil to become the state’s most valuable energy commodity. Parker Rig No. 114 was one of three drilling rigs specifically designed in 1969 for drilling wells to test atomic bombs. Another Anadarko Basin giant drilling rig has made history. 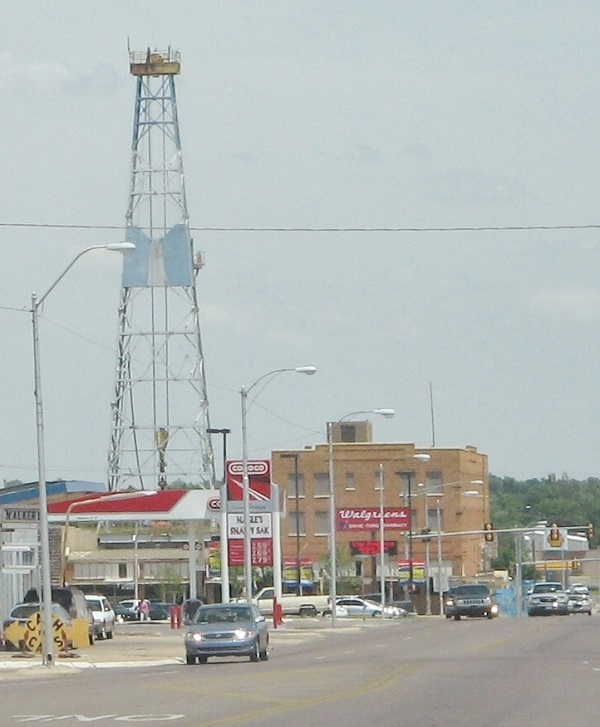 One of the tallest in the world, it today attracts tourists passing through Elk City, Oklahoma. In 1969, Parker Drilling Company signed a contract with the U.S. Atomic Energy Commission to drill a series of holes up to 120 inches in diameter and 6,500 feet in depth in Alaska and Nevada for nuclear bomb tests. Parker Drilling’s Rig No. 114 was one of three special rigs built to drill the atomic wells. Founded in Tulsa in 1934 by Gifford C. Parker, by the 1960s Parker Drilling had set numerous world records for deep and extended-reach drilling. Another massive rig, Parker Drilling Rig No. 114 was designed to drill wells for nuclear bomb tests. It was later modified to drill conventional wells at record-breaking depths. Since 1991 the 17-story rig has welcomed visitors to Elk City, Oklahoma, and the now shuttered Anadarko Museum of Natural History. Models of Apache drill bits were among the exhibits in Elk City’s Anadarko museum inside the Casa Grande Hotel, 1925-1949, which was listed on the National Register of Historic Places in 1995. The Parker rigs tested nuclear bombs. A separate government program used down-hole nuclear devices in New Mexico and Colorado as part of a wider set of experiments. The program, which included Project Gasbuggy for increasing petroleum production from shale, was established by the Atomic Energy Commission in 1957 to explore peaceful, constructive uses of nuclear explosive devices. Read more in “Gasbuggy” tests Nuclear Fracking. Following completion of the nuclear-test wells, Parker Drilling modified Rig No. 114 and its two sister rigs to drill conventional but record-breaking wells, some reaching four miles deep. Since 1991 the 180-foot rig (still one of the tallest in the world) has welcomed visitors traveling on Route 66 or I-40 to Elk City and the now closed oil museum. An independent producer and advocate for petroleum history, in 2006 John West preserved artifacts in the Anadarko Basin Museum of Natural History, which was later closed due to a lack of support. “Because it sits on a small lot, the rig could not be laid out and assembled on the ground, then raised into position, as rigs are built in the oil fields. Instead, pieces were raised by crane and pinned by Parker employees who climbed the rig as it grew taller,” notes a January 28, 1991, article at NewsOK. Among the deepest wells in the world have been the “Kola Superdeep Borehole,” a 1989 experimental well drilled the Soviet Union. It reached 40,230 feet deep. In 2008, an oil well was drilled to 40,318 feet in Qatar. In 2011, a 40,502-foot well was drilled offshore of the Russian island of Sakhalin.